Wool carder bees in the genus Anthidium are a beneficial pollinator that may be less familiar to pollinator-promoters than honeybees or bumblebees, but they are well-worth knowing! This little bee is full of determination. Female wool carder bees collect wooly material to line their nests. To do this, she uses her mandibles to scrape fuzzy trichomes from pubescent leaves, especially lambs ear. This scraping motion is reminiscent of a time when wool would be combed or "carded" to straighten the fibers. While she toils away collecting soft, fuzzy things for her baby bees (adorable? I think so), the male wool carder is aggressively defending his food resources and mating territory (usually hovering over a patch of lambs ear). 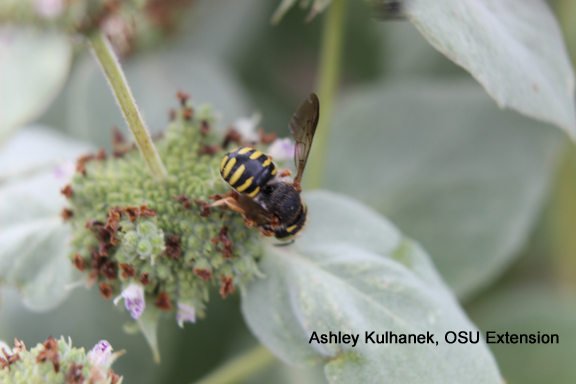 Male Anthidium bees are larger than females and he uses this heft to bump and body slam other insects that get too close to his territory, but remember- male bees can't sting. This behavior has made wool carder bees somewhat notorious, but they are just pollinators doing what pollinators do. They are strikingly colored with stripes of black and yellow on their abdomen, and could be confused for yellow-jackets on a cursory glance. They are solitary tunnel nesters setting up house in pre-existing beetle tunnels or pithy stems. They use the fuzzy trichomes to line their nests and build dividing walls between one provisioned egg cell and the next. Unlike other tunnel nesters in the Megachiidae family, the male bees are laid in the inner-most cells of these tunnels because they are larger and require more time to develop than the female bees. According to Wilson & Carril's The Bees in Your Backyard, there are only 4 species of Anthidium wool carder bees east of the Mississippi River. Wilson, JS. and Carril OM. (2016). The Bees in Your Backyard. Princeton, NJ: Princeton University Press.